Admittedly, my knowledge of Spanish and Portuguese history is scanty. I’m in the middle of some serious research on Portugal and knowing the history of the two countries is connected, this book looked like a good bet. The book was printed in two volumes and was published in 1973 by the University of Wisconsin Press. Stanley G. Payne has a long and distinguished career as an historian and is considered a specialist in Spanish fascism. His last position before his retirement was chairman of the History Department at the University of Wisconsin-Madison. 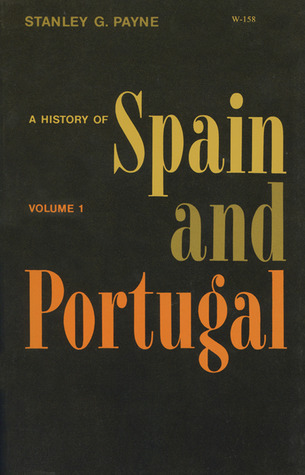 As Payne states in the preface, these volumes were written to address the need for a reasonably full and up-to-date comprehensive history of Spain and Portugal which can be used as a textbook for courses in Spanish history or as an interpretive account for other readers. His intention is to give accounts of the political and institutional history, including the church and religion, as well as social and economic history. He does not go into too much detail about literary and art history by design as these subjects are well covered elsewhere. For each kingdom on the Peninsula, Payne gives succinct details of how the peasants lived, how the nobility came to power, how royalty took over the government, how each kingdom (Leon, Castile, Catalonia, Valencia, Aragon, etc.) came into being and was absorbed into what we call Spain today. He explains the economies of each kingdom. There were sheep and cattle in Castile, trade within the Mediterranean and without by the eastern kingdoms, ironworks in the Basque area, etc. He explains how peasants worked the land, some making rent payments to the overlord and some who owned their land. There were slaves who worked the land. He talks about the soldiers who fought the wars. Payne doesn’t talk much about the actual kings and queens and only mentions a few of the most politically important ones by name. Payne is very precise in describing the religious situation in the Peninsula. There were pagans initially and then Christians, Muslims and Jews. He chronicles the histories of these people such as how they lived in harmony for the most part until the Catholic Majesties decided they wanted religious harmony and went to war. There were forced conversions or many people were expelled. The Catholic Church was powerful but royalty always had the ability to check this power. Personally I found this book to be masterful. The history of the Iberian Peninsula is fascinating in and of itself. But Payne’s writing and treatment of the subject matter had me totally captivated. He minces no words here. From the history of the ancients to the modern 20th century, this is a great read. To me the best material deals with the social history. I certainly learned a lot of new vocabulary! It’s not necessarily a definitive work but more of a comprehensive overview. Some may find it a bit of slog but if you stay with it, you will certainly find this work rewarding. This entry was posted in Book Reviews, General History Books and tagged book review, books, History of Spain and Portugal, Portuguese history, Spanish history, Stanley G Payne. Bookmark the permalink.